The flexibility of BowerBird is that anyone who has Joined a Project can add an identification to any Observation posted to that Project. 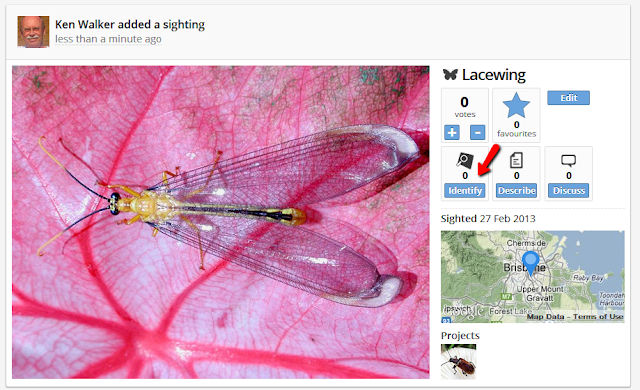 I have entered a new Observation but not provided an Identification: See the arrow points to 0 identifications. 2. 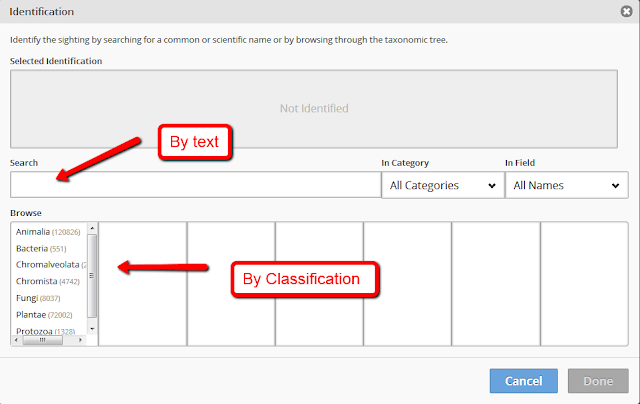 You can choose to expand the Classification hierarchy to find your scientific only name. Let's try the text search for COMMON name. 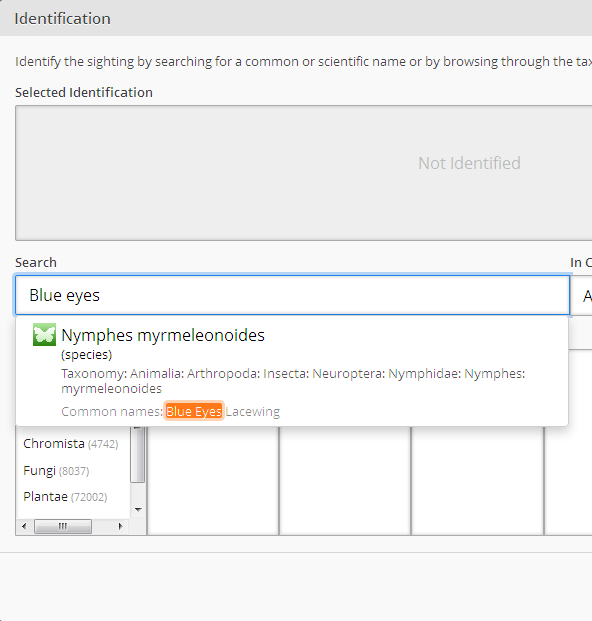 It's common name begins with "Blue eyes". There is only one animal in Australia with that Common name. You click the offered name to accept it. 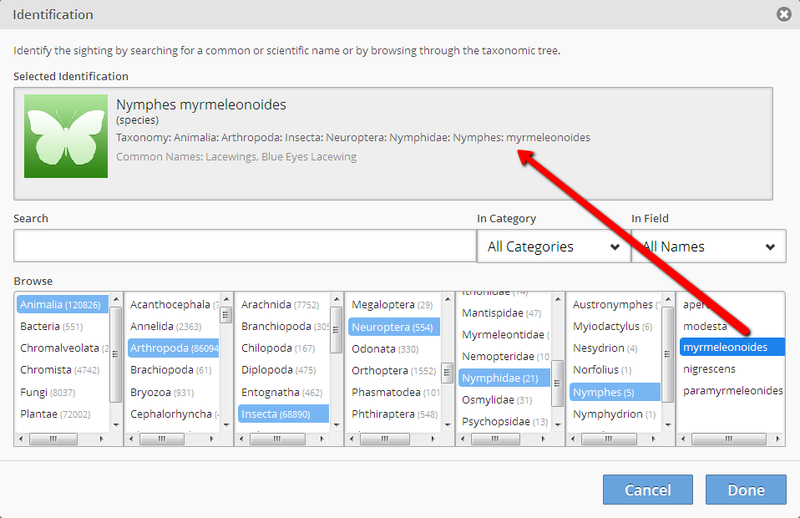 Let's try searching for the scientific name which has the generic name "Nymphes". 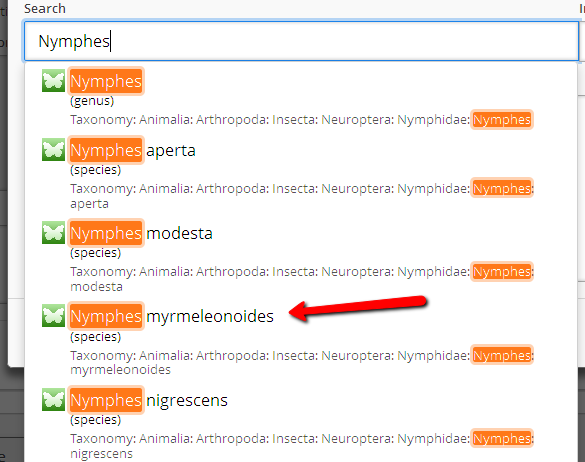 You can see that all species in the genus Nymphes are returned and you just need to click the name you want. 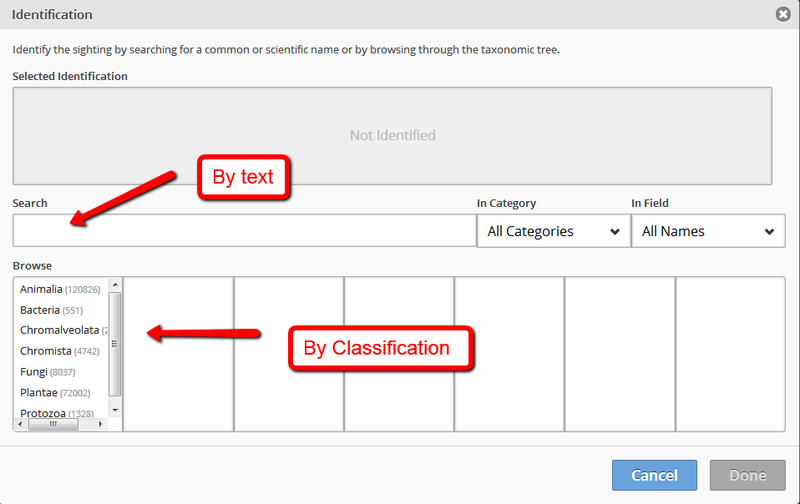 Let's try the Classification search. 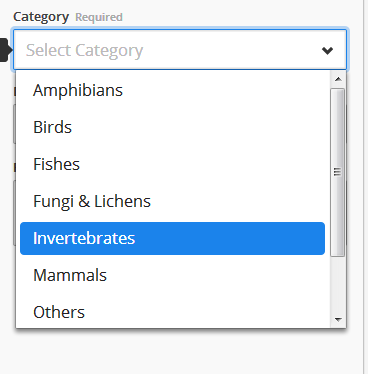 Here we have gone down from Animalia to the correct species name. 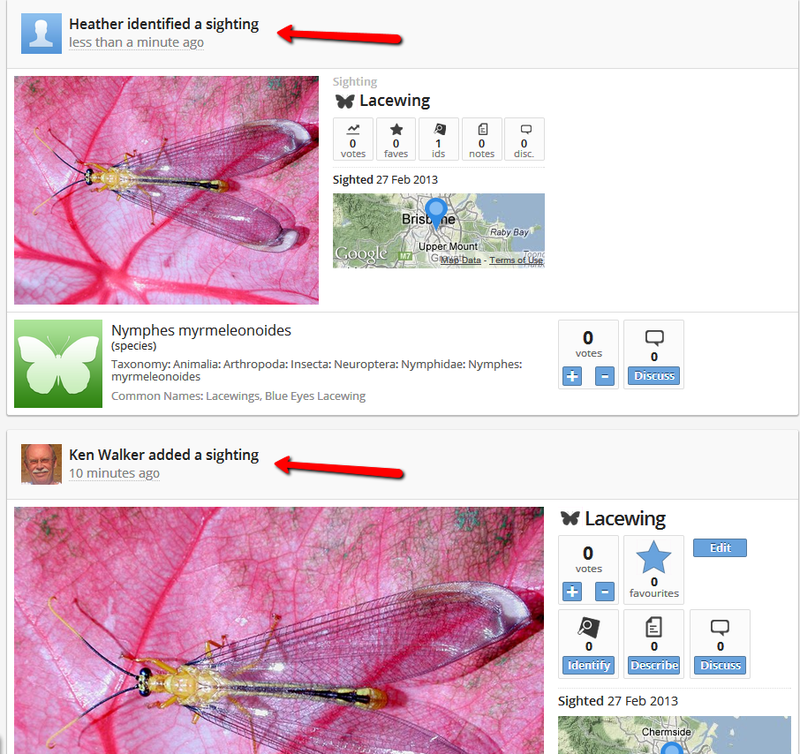 Now, my original Observation has had its Identification counter updated to reflect that an identification has been done. That's identification in a nutshell. 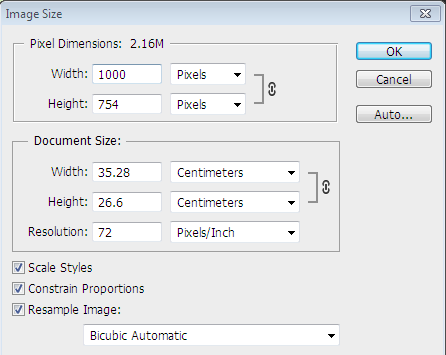 Image Types and Suggested Image size for BowerBird use. 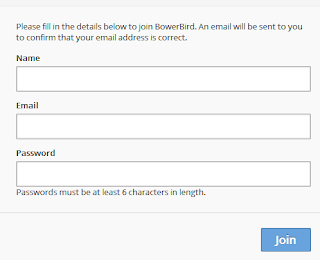 BowerBird will accept a wide variety of image types: JPEG, PNG, BMP, GIF and TIF. 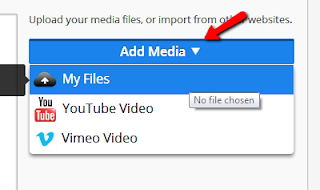 We suggest you primarily upload JPEG or PNG images. Here is how to JOIN, LOGIN, SELECT OR CREATE A PROJECT AND CREATE A NEW OBSERVATION. Step 1. Register on BowerBird. 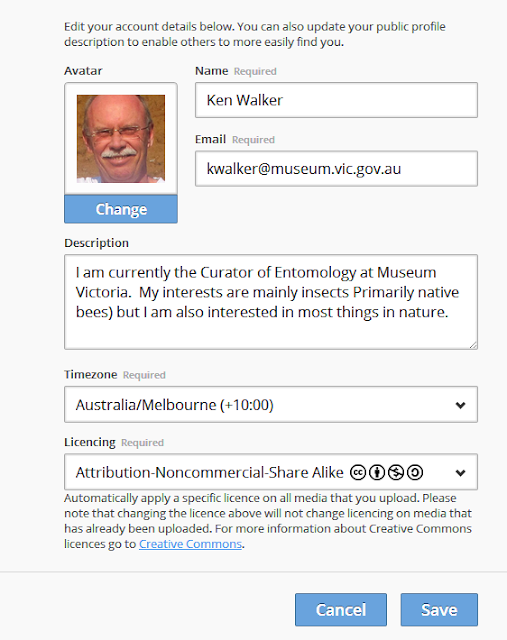 Once inside BowerBird -- you can enhance your Profile by Editing it. 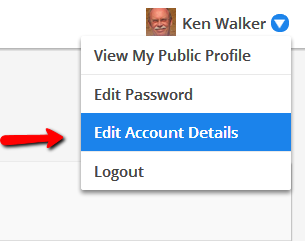 Click the button in the top right corner and Edit Account Details. 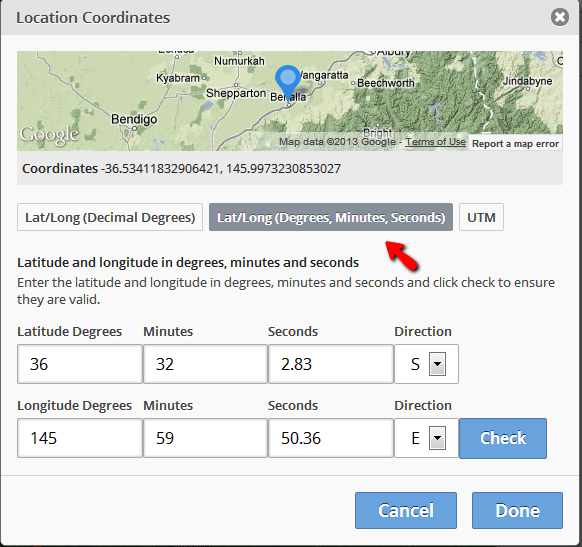 You can add an avatar, give some details about yourself and even select what time zone you are in. 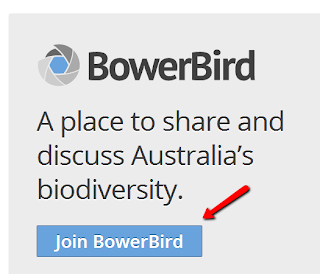 Once logged in, you are presented with your own personal BowerBird space. 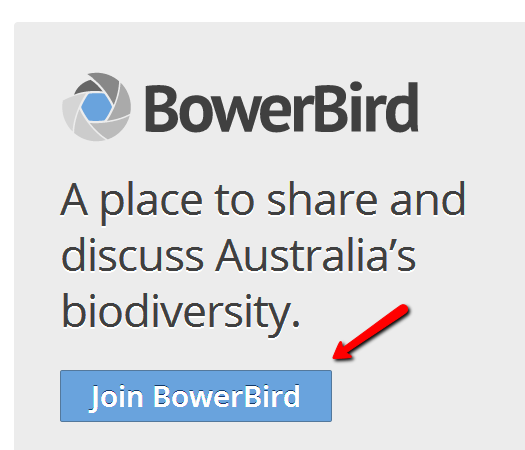 Because it is your own BowerBird space, you must tell BowerBird what you want to see and do in BowerBird. 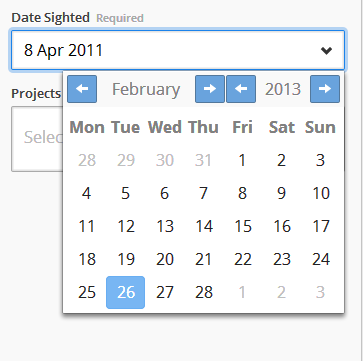 The "seeing" and "doing" are done through Projects. 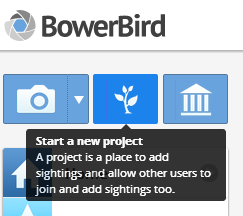 The first thing to do in BowerBird is to click the Projects button at the top. 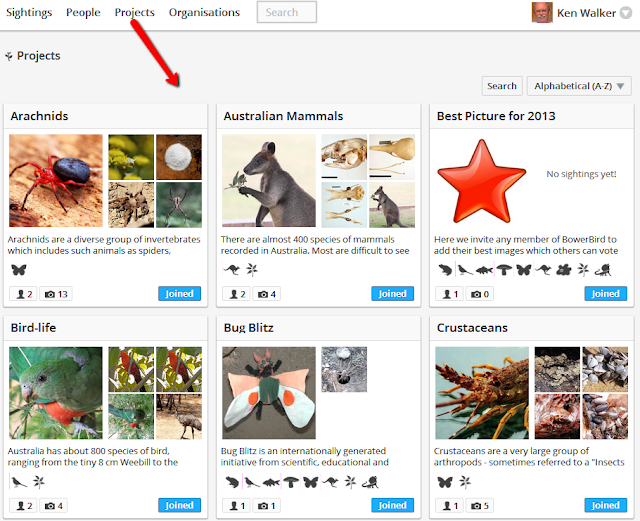 This will show you a display of all of the Projects that have been created on BowerBird. You can choose to Join as many of these Projects as you like. 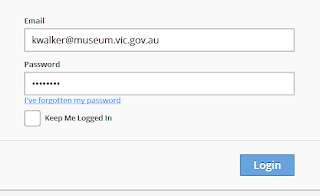 You simply click the "Join" button in the bottom right corner of the Project box. 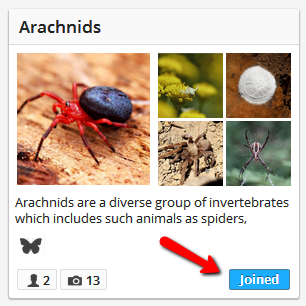 If ever you want to leave a Project, simply go back to the Project Box and re-click "Joined" which will change to "Join" and you will removed from the Project. You can also choose to Create a New Project. 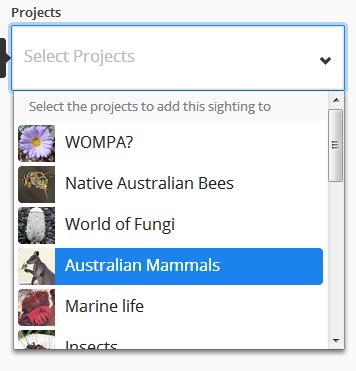 Simply click the Project create button in the top left corner. This will open a template for you to complete. You can add a Project avatar and Project Background images. 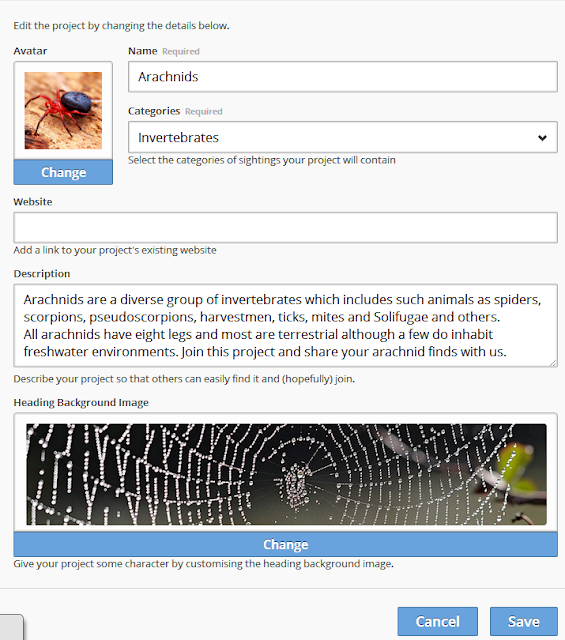 Provide a name, what animal or plants groups will feature in the Project and provide a brief description of your new Project then click Save. Other will hopefully see your Project and decide to Join and to contribute. 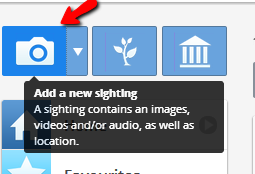 Click the "Add a new sighting" button in the Top left corner. This will open a template. You can add up to 20 images per Observation. 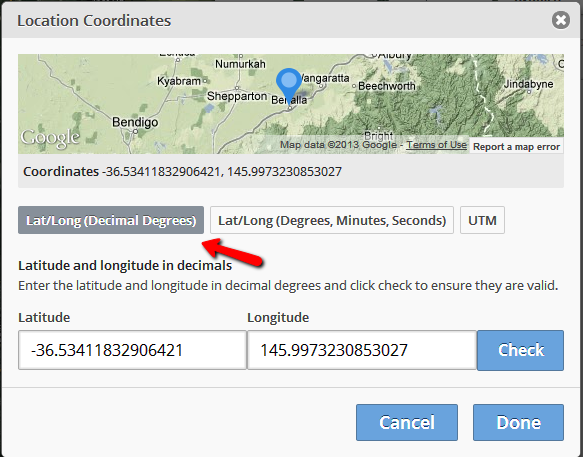 You can TYPE IN A LOCATION NAME (eg. Benalla). Google Maps will offer you a known locality and you select or reject it. If selected, a blue pin will drop onto the map. 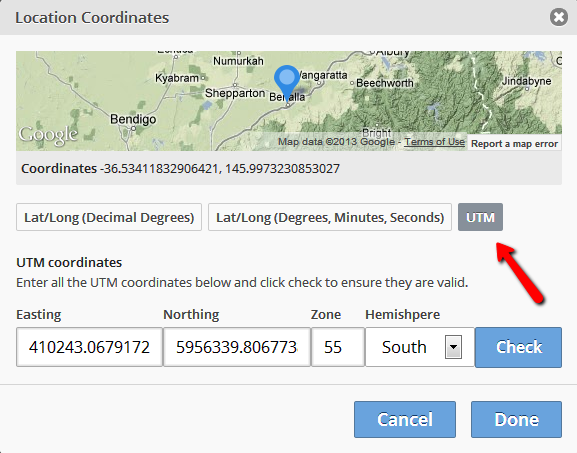 If you want to adjust where the pin is placed, You can change the View of the Map to Satellite and you can EXPAND the map. 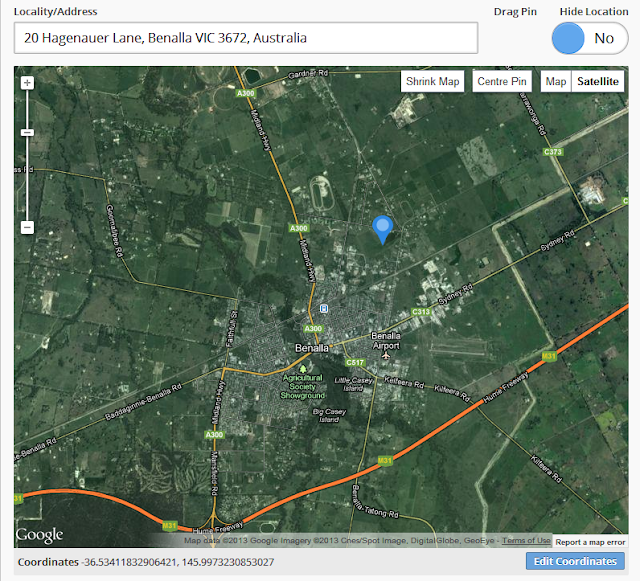 Here is an example of where I have moved the pin from the middle of Benalla into the NE. Step 6. ADD A PROJECT. That's how to add an Observation. In other Blogs I will show you how to edit an Observation, Identify it, Vote for it, Add Descriptions, Comments and Tags.